As the MCE British Superbike Championship reaches the penultimate round at Silverstone, JG Speedfit Kawasaki and Showdown contender James Ellison are eager to make a return to the top step of the podium. This weekend will also see Luke Stapleford make his Superbike debut as he joins the team for the final two rounds. It was a strong start to the Showdown for Title Fighter James Ellison, who enjoyed a brace of podium finishes at Assen. Lying third in the series, he now sits just 41 points behind the lead and a return to the top step of the podium this weekend will see that gap reduced before the season finale at Brands Hatch. Making his debut in the blue-riband class this weekend will be current British Supersport leader Luke Stapleford, who joins JG Speedfit Kawasaki for the final two rounds. Whilst his primary goal will be to secure the Supersport title for Profile Racing, the entire team are looking forward to welcoming Luke and helping him achieve his best on the ZX-10R Superbike. As one of the fastest circuits on the calendar, the 3.667 mile long Silverstone track is also the longest. Last year saw Ellison enjoy an emotional podium return, just weeks after breaking his femur and with a host of upgrades arriving ahead of this weekend, the high speed, flowing nature should suit the Kawasaki machine. The Silverstone weekend will also see leading security specialists Datatag join forces with the JG Speedfit Kawasaki team. Along with their logo featuring across the pit boarding and both Superbikes, Datatag are offering one lucky winner a pair of paddock passes and a tour of the team’s garage. Head over to Twitter (@GBmoto) to find out more. Despite still suffering from his injured wrist, James Ellison is looking forward to a strong showing this weekend, “I was really pleased with Assen, I’m still not 100% fit yet and am still getting some grief from the wrist but to be able to walk away with two podiums was mega. Silverstone proved a good weekend last year, again I was struggling with the injury from Brands but the bike was working really well and we made our return to the podium. I’m confident that with the improved package we have this year, then the podium is definitely possible. Excited to make his BSB debut, Luke Stapleford said, “I really can’t wait for this weekend! My main priority is of course to win the Supersport Championship but I really am looking forward to getting out and trying the BSB bike. I’ve ridden a 1,000cc bike before, so although it will be a big jump to try the Superbike hopefully it won’t be too bad. 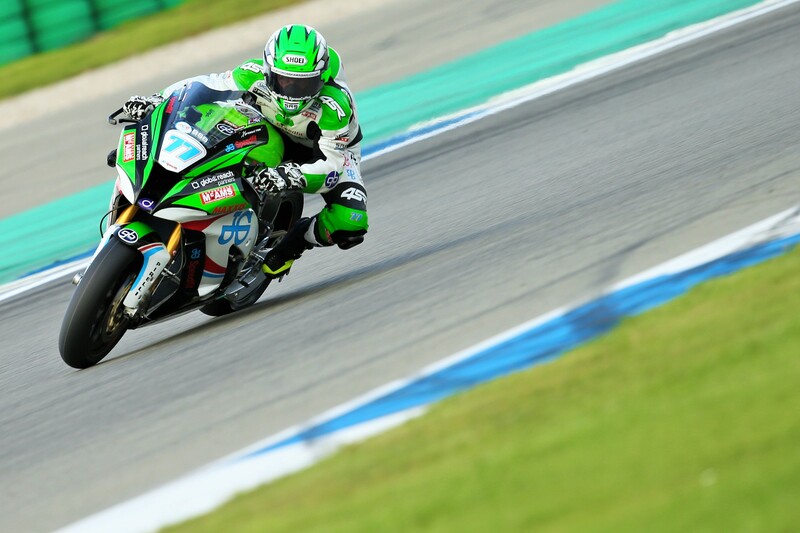 JG Speedfit Kawasaki Team Principal Mark Smith-Halvorsen added, “We’re getting to the crunch time of the season now and we kicked off our Showdown fantastically at Assen. We know we’re still the outsiders when it comes to the title but, as we’ve seen in previous seasons, anything can happen. We’ve proven already this season that we’re capable of winning races and I’m confident we’ll return to the top step before the final flag this year. I’m also looking forward to seeing how Luke will get on. He’s had a fantastic season in Supersport, is a real star of the future and we’ll be giving him our full support this weekend.